I've only just started using the Nikon, so anything i have to say about it is purely a first impresion, but this page is going to change as i get more familiar with the camera. I should say the camera pictured above is not my Nikon. If you squint, minus some chrome and paint, and place some cleaning marks on the lens, you should have something resembling my Nikon. The horrifying aspect of all of this has been realising i have to learn a whole new set of specifications and codes. For example, new screens A-J may or may not be relevant to what i need, and how do i find out? The two sites linked below have taken me to some measure of what i'm dealing with, but I know i'm going to have to find out the hard way! This first site has been invaluable in getting me started, as has Godfrey DiGiorgi (Thanks again Godfrey!). The second site is merely an exhaustive page of Nikon Links that had me scrambling around the net-not totally unlike what i have for you here! This is Michael Liu's very thorough Nikon site. 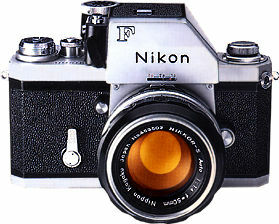 Dons Nikon Links is an exhaustive web summary of Nikon. This is the Nikon Historical Society who have a good forum for information about collecting, restoration, and a board for buying or selling.